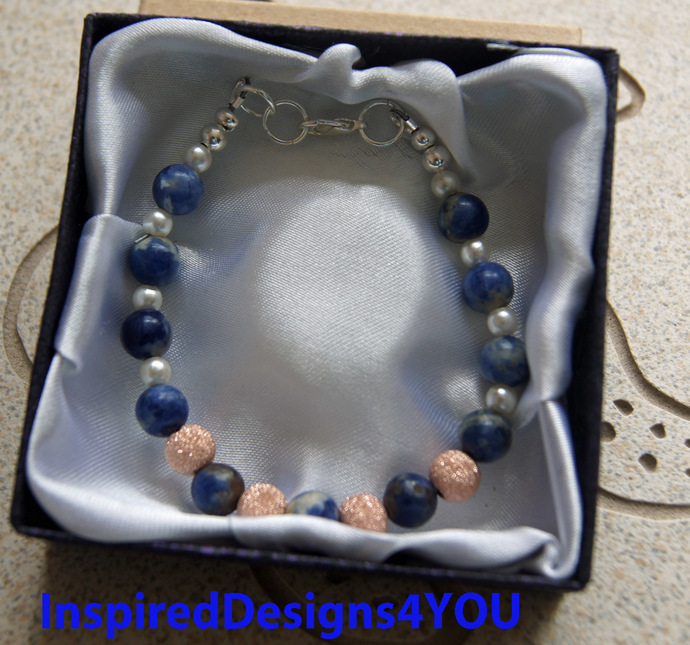 Sodalite Beaded Bracelet. Featuring pearl and rose 14k gold. Bracelet - Women's Small. Beautiful paired sodalite gemstone captures the rose peach 14K crystal. The white pearls adds a finishing touch to this elegant signature piece Finally the silver beads complete this work. Blue, white and rose work beautifully together. Handmade and designed by me. Stand out with sparkle 1/20 14K rose gold-filled 8mm stardust round bead. 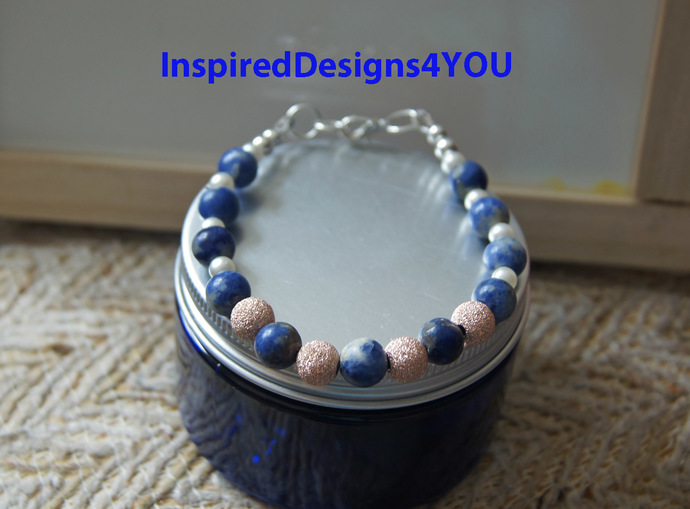 The rich sodalite contrasts the rose peach luxury beads, lovely dept of colour in the round beads. Warm and cool colour. Inspiration. Memories of a Caribbean beach and visiting the Sodalite mines in Bancroft Ontario as a teenager, where I became a seasoned 'Rock Hound' further grounding me in gemology. The measures 7.0 wrist size - women's. Finished with Sterling Silver jump rings, and lobster clasp, the beads are strung on jewellery wire with wire guards to ensure years of wear. Hypo-allergenic and nickle free for your wearing pleasure. You will receive a complimentary 'anti-tarnish' tag to keep your jewellery pristine. Other sizes are available please make your selection in the drop down window. Sodalite is a rich royal blue mineral widely enjoyed as an ornamental gemstone. Although massive sodalite samples are opaque, crystals are usually transparent to translucent. Sodalite is a member of the sodalite group with hauyne, nosean, lazurite and tugtupite. If there is anything we can do for you - just ask!